MLB has had its fair share of problems this season, and last week former manager Dusty Baker resurfaced to remind them of a perennial one. Baker was fired last season after leading the Washington Nationals to a 97 win season and another playoff berth. He’d previously led the Cincinnati Reds to consecutive 90 win seasons, and three in four years. The Reds also made it to the playoffs in his final two seasons. But there’s one bit of shared history in both those jobs. Baker got fired right after those teams didn’t make it to the World Series. Interestingly enough, since his departure the Reds have remained at the bottom of the National League Central Division, and this season the Nationals are floundering, buried in third place behind the resurgent Braves and Phillies. Baker gave a lengthy interview last week to Ken Rosenthal of the Atlantic. Though he’s now working again with the San Francisco Giants in a consulting capacity, it’s clear he still wants to manage and feels he got a raw deal in his final two stints. It’s easy to dismiss Baker as another disgruntled former employee, except that (1) the teams that fired him have done far worse without him, even as people who supposedly are more attuned to contemporary ball players were hired to replace him and (2) MLB’s hiring record when it comes to Black managers is even worse than Black players. Currently there is one Black manager in the majors, the Los Angeles Dodgers’ Dave Roberts. There are two Latinos in Boston’s Joey Cora and the Nationals’ Dave Martinez. Baker didn’t bad mouth his successors, but did make some intriguing points during his interview with Rosenthal, particularly in regards to his time with the Reds, a team in a very conservative city. It was widely reported in both Cincinnati and Washington that Baker was at best lukewarm regarding the takeover of MLB by analytics-driven, non-playing general managers who insisted on having- input on every decision from pitching matchups to batting orders. Now there’s obviously room within the sport for some of that, and the Cubs’ Joe Maddon is one who has fully embraced that approach. Yet he’s among Baker’s biggest backers, and objected loudly when the Nationals fired him. It was also quite informative to see his views on the struggles of the Nationals’ best hitter Bryce Harper. Harper has had a much better second half, but experienced an awful first two months. When Rosenthal said that Harper never struggled for two months when he was playing with Baker, his response was short and simple: “I know.” Baker also talked about disparities he saw in the treatment of Black ex-players and ex-managers, the fact that the 2018 Nationals were struggling despite having essentially the same roster he’d had the previous two years, and the definite possibility of collusion regarding free agents. Certainly no MLB team has to hire anyone that they don’t feel fits their managerial or playing philosophy. 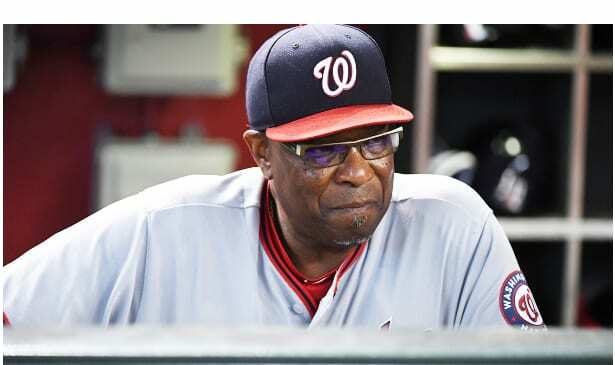 There’s no guarantee that if Dusty Baker stayed with the Nationals they would be any better this season. But given his past track record, the odds say they wouldn’t have started the year so poorly, or gotten so far behind they’re now in an uphill battle for the wild card, and even further behind in the divisional chase. It’s sad MLB seems so bent on emphasizing stats that they overlook the human element. Not everything can be reduced to numbers, and such things as team chemistry cannot be mathematically quantified, nor other team qualities like competitive toughness. It would be silly to say there’s no place for analytics in sports, and indeed they do offer in some instances valuable additional insight into athletic performance and personal matchups in key situations. But anytime a sport feels the contributions of someone like Dusty Baker, with decades of playing and managing experience and knowledge, aren’t as valuable as some random statistical profile, there’s something clearly lacking somewhere.